Cox Media Group’s Orlando Stations to Produce ‘Unity in the Community.’ Both news/talk WDBO “News 96.5” and urban contemporary WCFB “Star 94.5” in Orlando will simulcast a special program called “Unity in the Community: A Live Discussion About the Current Role of Both Law Enforcement and Citizens in our Communities” tonight at 7:00 pm. The program will feature a panel of experts to share what law enforcement is doing in Central Florida, and answer questions from concerned citizens. They will discuss the roles and responsibilities of both law enforcement and citizens when dealing with each other. Panelists will include: Orange County Sheriff Jerry Demmings, Orlando Police Chief John Mina, Sanford Police Chief Cecil Smith, former Chief Judge Belvin Perry, and Crimeline executive director Barb Bergen. The panel discussion will be co-moderated by WDBO’s Joe Kelley and WCFB’s Monica May. Larry Mendte Named Morning Host at WILM, Wilmington. Former longtime Philadelphia TV news anchor and radio host Larry Mendte is named morning drive personality at iHeartMedia’s Delaware news/talk stations WILM, Wilmington and WDOV, Dover. 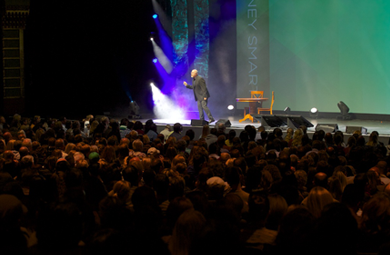 Company regional market president Chris Walus states, “Larry is an extraordinary talent who has the unique ability to engage audiences across all demographics. 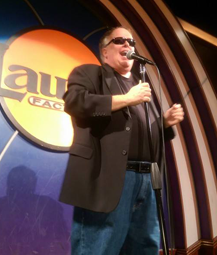 He has an impressive record of success in Philadelphia, New York, Los Angeles, Chicago and San Diego. 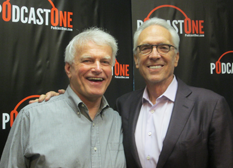 Delaware listeners will be incredibly impressed with his ability to connect, engage and inform.” In addition to his work in Philadelphia, Mendte has served at 77WABC in New York; “Access Hollywood” in Los Angeles, WBBM-TV and WLS-AM in Chicago. ‘105 The Ticket’ in Minneapolis Drops Local Talk. Ousted local radio personality Bob Sansevere tells the Pioneer Press that the Cumulus Media-owned trimulcast of WGVX, WRXP, and WGVZ – branded as “105 The Ticket” – wasn’t able to put up a ratings fight against the sports talk competition in the market and that’s probably why his show and “Radioactive Sports” with Mike Morris and Ben Holsen were canceled. The station is now airing the entire slate of CBS Sports Radio Network programming. WCHV, Charlottesville Talk Host Joe Thomas’ Morning Show Simulcast on Television Outlet. The “Joe Thomas in the Morning” program on WCHV, Charlottesville, Virginia is now being simulcast on Gray Television’s “all-local, all-the-time Newsplex Now” channel. Thomas, who also serves as program director for Monticello Media-owned WCHV, comments, “I was told back in the Bayside (NY) High School TV studio that I should go into radio because I would never be happy in television since I would never be able to have the irreverent fun I displayed in class. It took 32 years, but I’m going to prove my teacher wrong!” Thomas says he’s also on the lookout for short-form video content that could be included in the TV broadcast to create a unique viewer experience. Reach out to him with suggestions at jthomas@cvillestations.com. Odds & Sods. The Los Angeles Lakers and ESPN O&O KSPN, Los Angeles announce they have agreed to an extension of their radio play-by-play deal through the 2021-22 season. “ESPNLA” will carry all 82 regular-season games as well as the entire preseason and every playoff game. John Ireland will continue as the play-by-play commentator for the Lakers radio broadcasts, with Laker great Mychal Thompson remaining as the color analyst. Both are ESPNLA personalities – Ireland co-hosts the “Mason and Ireland” show and Thompson co-hosts the “Thompson and Trudell” program…..TheBlaze Radio Network’s Buck Sexton fills in for Rush Limbaugh on the Premiere Networks syndicated program today (6/10). TheBlaze says Sexton is the only personality who has guest hosted for Rush Limbaugh, Sean Hannity and Glenn Beck. Syndicated Talk Host Danielle Lin Takes Show to India. Dynamic health and lifestyle talker Danielle Lin took her syndicated radio talk show, “The Art of Living and the Science of Life,” to Bangalore, India reporting on the new trend of “Medical Tourism.” She tells TALKERS, “Going global makes perfect sense in a podcast world. I have discovered first hand that international expansion is not only lucrative…it’s essential in a digital world. With a strong list of sponsors primed from US relations, linking countries like India was a natural fit for expanding my US brand. The money flows in both directions as companies create bonds by targeting niche markets. By producing valuable content on the national platform, we were able to translate the same conversation with the growing middle market in Bangalore. 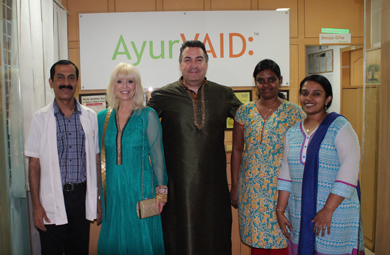 We started early enough in our planning to build a base that would connect us to a worldwide listenership.” Lin adds, “The local and international conversations are relevant to everyone when it comes to improving life.” Lin (second from left) is pictured here with the leading Ayurvedic physcians at AyurVAID Hospital in Bangalore. Texas Pool Party Incident, ISIS Military Progress/U.S. Iraq Policy, Obama Trade Deal, New York Prison Break, News from Apple WWDC, Bilderberg Group/G7 Meetings, Caitlyn Jenner Case, and NBA-NHL Finals Among Top News/Talk Stories Yesterday (6/9). The fallout from a police officer’s actions at a Texas pool party; the continuing success of ISIS in Iraq and questions about the U.S. military’s policy in Iraq; the TTP trade deal and concerns over lack of understanding of what the pact contains; the search for two convicted murderers who escaped from a New York prison; news of the new digital music platform from Apple from the company’s Worldwide Developers Conference; questions about future global policies as the Bilderberg Group meets in Austria and the G7 summit takes place; ongoing chatter about the Caitlyn Jenner case and transgender issues; and the NBA and NHL Finals were some of the most-talked-about stories on news/talk radio during the week, according to ongoing research from TALKERS. Latest Pew Research Report on Political News Consumption Prompts Questions About Ever-Shifting Definition of ‘News.’ The just-published “Millennials and Political News” report from the Pew Research Center is subtitled “Social Media – the Local TV for the Next Generation?” It looks at how three different generations – Millennials, Gen Xers, and Baby Boomers – get their political news today and, not surprisingly, suggests that Millennials get more of their political news from social media than do the other two groups (especially Baby Boomers, who cite Local TV as their primary source). However, the study goes deeper than just that conclusion and presents some interesting data illuminating media usage among these three generations. But the study also reminds us that social media as a conduit of news is personalized from the start. “Understanding the nuances of the social media news environment is complicated: The experience is individualized through one’s own choices, through the friends in one’s network and their proclivities, and through algorithms – all of which can change over time. We are only beginning to understand these complex interactions.” Although good for marketing purposes, does the suggestion that social media makes it easier for people to “swim with their own” make them less likely to be introduced to ideas or opinions they’ve not experienced before? How does the “narrowcasting” of political news affect the electorate? But a question perhaps more relevant to TALKERS readers is what is the definition of a news source? The Pew survey asks respondents about specific programs, networks, newspapers, or news outlets and asks each generation about their use, awareness and trust of each. Premiere Networks’ Rush Limbaugh, Sean Hannity and Glenn Beck were listed among the 36 sources for political news (as was Comedy Central’s The Daily Show), and this brings up the old question of whether a talk radio show (or even a TV comedy show) are news programs in the same way the “CBS Evening News” is a news program. The 36 sources were suggested to the respondents by Pew and one has to wonder how different the list of cited political news sources might be if respondents were asked to name their most used and trusted sources, instead of choosing from a list. Regardless, this study certainly serves as a reminder that models of presenting news are changing almost as fast as the definition of what news is. See the Pew study here. WABC, New York Announces Pre-Tony’s Program with Joan Hamburg. Big Apple talk radio personality Joan Hamburg will be broadcasting a special show this week from the famous Sardi’s Restaurant in the heart of Times Square on 77WABC to celebrate Sunday’s Tony Awards. On Wednesday, June 3, Hamburg will speak with special Broadway guests and 100 of her loyal listeners during this sold-out luncheon event. 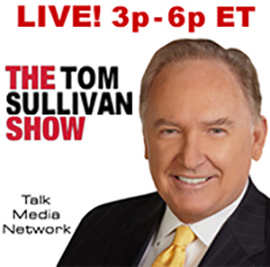 The show will air on Saturday, June 6 from 1:00 pm to 3:00 pm. Guests will include Tony nominees: Jason Alexander, Geneva Carr, Marc Kudisch, Tyne Daly, Harriet Harris, Brian Darcy James, Christian Borle, Brad Oscar, Chita Rivera, Kelli O’Hara, Robert Fairchild, and Kelsey Grammer. Leading Progressive Talk Show Host Thom Hartmann Interviewed on Latest Installment of “Up Close and Far Out.” Top 10 Heavy Hundred member and multi-platform talk star, Thom Hartmann, is this week’s guest on PodcastOne’s international hit series, “Up Close and Far Out with Michael Harrison.” Hartmann and TALKERS publisher Michael Harrison discuss what they both describe as the “messed up state” of much of the categorical labeling (left, right, center) that is used to describe both talk show hosts and politicians involved in the national discussion of complex issues. 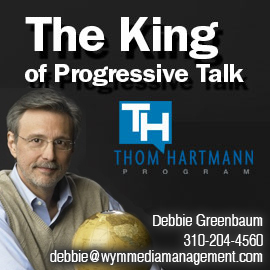 Hartmann – branded by industry observers and the media as a “liberal,” and/or “progressive” who approaches his show from a “left” position — says, “There really is no ‘left’ in America as there is in other countries. There is the ‘right,’ the ‘far right,’ and the ‘center.’ No real ‘left’ to speak of.” Hartmann describes himself as a lifelong “serial entrepreneur who hasn’t had an employer in about 40 years.” He says, “There is no truth in the idea that liberals hate business.” Hartmann goes on to cite a number of “fundamental American” issues upon which “both progressives and Tea Partyers agree.” Hartmann cites issues upon which he agrees with conservative Cumulus/Westwood One host Mark Levin (who will be Harrison’s guest on next week’s installment of the podcast) and points out that, although he disagrees with just about every political position taken by Cumulus/Westwood one star Michael Savage, he greatly admires the host’s skill as a talk broadcaster. Hartmann says he loves broadcasting as much as he loves politics. 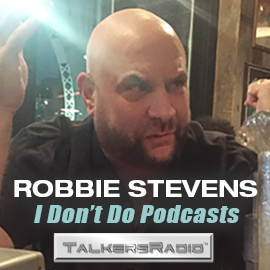 To hear the entire podcast click here or click the player box in the right hand column of every page on TALKERS.com. Boston Herald Radio Tweaks Lineup. New personalities are being added to the lineup at Boston Herald Radio effective today (6/2). The morning program “Boston Herald Drive” – airing from 7:00 am to 9:00 am – will add John Sapochetti as co-host alongside current personality Adriana Cohen. Sapochetti’s progressive takes will provide some balance to Cohen’s conservative stance. Also, in mid-afternoons, “Fargo Street,” airing from 1:00 pm to 4:00 pm and featuring hosts Chris Villani and Tyler Sullivan, will cover “current events, sports and entertainment.” Villani comments, “I love the chance to broaden all of our horizons a bit. It is a big world and there are big conversations to have.” Also announced by the Herald is executive producer Tom Shattuck’s powering up the multimedia center in the Herald’s City Hall bureau to deliver daily news from City Hall. Odds & Sods. An FM signal is added to Beasley’s South Florida business talk outlet WSBR, Boca Raton. Via translator W245BC – whose primary signal covers an area to the northwest of Fort Lauderdale – the “740 AM MoneyTalk Radio” format will be heard on 96.9 FM as well…..Pubcaster WBUR, Boston is launching a six-week pilot season of “You’re the Expert,” a new science and comedy program hosted by comedian Chris Duffy. Each episode is recorded in front of a live audience and features a guest expert in a specialized field, such as a doctor who studies Neanderthal DNA or a researcher who examines bacteria from the New York Public Transit System. A panel of comedians then uses questions and games to try and guess what the expert does and why his or her field is important…..Salem Media announces that it is declaring a quarterly dividend of $0.065/share payable on June 30 for shareholders of record as of June 16…..Talk show host Charles Butler fills in for Jerry Doyle on his Talk Radio Network program this week. Miss America Pageant Returns to Atlanta City. 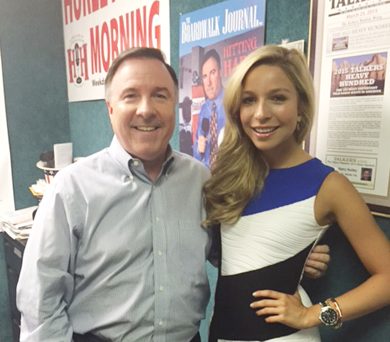 And WPGG, Atlantic City morning legend Harry Hurley got to spread the news of the beauty pageant’s return to the city with 2015 Miss America Kira Kazantsev in the studio to talk about it. The pageant returned to Atlantic City in 2013 after six years in Las Vegas. 2016 Presidential Prospects/Lindsey Graham Joins GOP Race, TSA Fails Explosives Test, Patriot Act Expires, SCOTUS Head Scarf Ruling, Hastert Indictment, ISIS Military Success/U.S.-Trained Tajik Colonel Defects, and Bruce Jenner Case Among Top News/Talk Stories Yesterday (6/1). The potential candidates for president in 2016 and Republican Lindsey Graham’s entering the race; the controversy over the TSA’s failure to detect fake explosives 97% of the time; the expiration of the Patriot Act and questions about NSA phone surveillance in the aftermath; the Supreme Court’s ruling in favor of a Muslim woman who was denied a job because of her head scarf; former GOP House Speaker Dennis Hastert charge with violating banking laws; the military success of ISIS in Iraq and Syria and a U.S.-trained Tajikistan colonel’s defection to ISIS; and the ongoing transition of Bruce Jenner into Caitlyn were among the top news/talk stories yesterday, according to ongoing research from TALKERS. Little Rises to President of Phoenix Market for iHeartMedia. Assuming the position left briefly vacant by Scott Hopeck after he was promoted to the same post at the New York City cluster is Linda Little. She moves up from her SVP of sales position with the station group. Prior to that, she was GSM for adult contemporary KESZ and country KNIX. She also served as integrated media business development manager. She comments, “I have had the privilege of building my media career in Phoenix and am very fortunate to have worked for a company that has given me many opportunities to grow while constantly evolving with the industry.” In this position she’ll oversee news/talk KFYI, talk KOY, and sports talk KGME. Schreiber Promoted at Mercury Radio Arts. Moving up from his head of strategy and special projects position with Glenn Beck’s Mercury Radio Arts to president of the company is Jonathan Schreiber. In this new post, Schreiber will oversee Mercury’s divisions including digital, radio and publishing and its continued growth in film, television and “digital content across different genres beyond politics and current events.” The company says Schreiber will continue to serve as an advisor to TheBlaze, the company’s news, information and entertainment network led by CEO Betsy Morgan. Schreiber has an 18-year pedigree in the tech, mobile and entertainment businesses. Beck says, “I personally recruited Jonathan to help take our company to the next level. Since joining Mercury, he has played an integral role in both the strategy and execution at Mercury Radio Arts and my overall business philosophy and approach. He is a trusted advisor and this title reflects the leadership position he has and will continue to assume in this new era for both me and our business. Industry Mourns Don Quayle. The first president of National Public Radio (NPR) has died: Don Quayle was 84 years old. NPR’s Susan Stamberg recalls that Quayle gave her her first radio job. “It was the early-1960s and he was head of the Educational Radio Network – the precursor of NPR – a little network of 12 east coast stations that developed a daily drive-time news show. He hired me to help produce it. When this national network arose, he was an obvious choice to run it. Don was principled, decent, and astute. In the euphoric tumult of our first years, he navigated the choppy seas of building a public radio system. 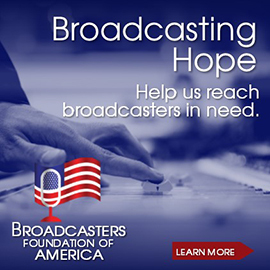 He knew NPR had to serve our listeners, above the competing needs of stations, boards, and funders.” The program to which Stamberg alludes, of course, is “All Things Considered,” which Quayle debuted on NPR in 1971. He headed the network – which now has more than 900 member stations – from 1970 to 1973. Prior to that (1960 – 1962), Quayle managed Boston public outlet WGBH. Five years ago, the Logan, Utah native received an honorary doctorate of humane letters for his “significant contributions” to public broadcasting from his alma mater, Utah State University. Premiere and TheBlaze to Present Memorial Day Special. The annual Memorial Day radio special produced by Glenn Beck’s TheBlaze Radio Network returns in 2015 with Premiere Networks handling affiliate relations. The three-hour program – titled “Reflections from a Grateful Nation” – features the hosts, writers and editors of TheBlaze and TheBlaze.com, including: Doc Thompson, Skip LaCombe, Buck Sexton, Jay Severin, Chris Salcedo, Mike Broomhead and others. In addition to special appearances by award-winning actor Gary Sinise, “Wheel of Fortune” host Pat Sajak and members of the military, listeners will hear personal stories and conversations about the meaning of the holiday in this special tribute to those who fought and gave their lives to defend America’s freedom. 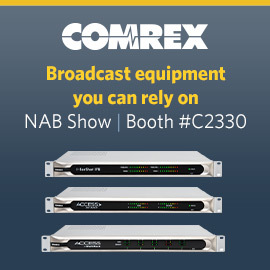 It’s available to news/talk stations for airing from May 23-25. Interested stations can phone Premiere at 818-377-5300. Michael Harrison Interviews Boston Herald Editor-in-Chief Joe Sciacca on Weekly Podcast, ‘Up Close and Far Out.’ In a candid and informative interview on the popular weekly podcast “Up Close and Far Out with Michael Harrison,” Boston Herald editor-in-chief Joe Sciacca discusses his views on a wide variety of media-related topics that include, among others: the state of the newspaper industry in a changing media landscape; the impact of the digital era on journalism; and his experience in being involved with his newspaper’s pioneering effort in online news/talk/sports radio broadcasting – Boston Herald Radio. 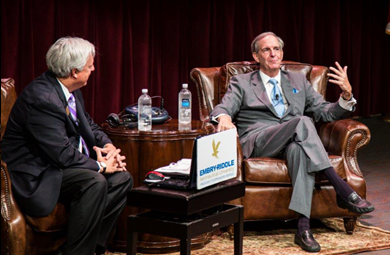 During the extensive conversation, Sciacca – a 37-year veteran of the newspaper business as a reporter, columnist and editor — tells TALKERS magazine publisher Michael Harrison that the biggest challenge facing journalists in the newspaper business today is “keeping their print product relevant.” He tells Harrison, “I believe this is the greatest time to be leading a news organization in America even though resources are challenging and newspapers are experiencing difficult times in terms of revenue. There really is a great window of opportunity to be creative – to reinvent our business. So when I became editor five years ago after being at the Herald for 32 years, I embraced the challenge because even though I knew the road was going to be difficult to navigate, we have done some incredible things over the last five years and we’ve really transformed what was purely a print organization into a multimedia news organization.” This transformation, of course, includes the launch of Boston Herald Radio – the newspaper’s online talk station that produces 11 hours of original, live content every weekday from a studio located right next to the newspaper’s newsroom. It has proven to be a major source of breaking stories, not only for Boston-area news consumers, but for the media across the country and around the world. Harrison and Sciacca delve into media theory and discuss differences in the psychology between reading stories online as opposed to the printed page. They also analyze the impact of video cameras inside a radio studio and the differences between what Harrison describes as “great radio or bad television.” Sciacca discusses the Boston Herald’s commitment to getting the stories right, rather than just being first – a pressure amplified by the competition generated by the 24 hour non-stop, digital news cycle and he recalls how coverage of the Boston Marathon bombing was particularly challenging because of all the false information that was out there in the general news media’s frenzy to stay on top of the breaking story during its early hours and days. 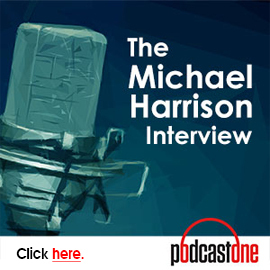 Harrison describes his theories about the emergence of what he calls “stickless” radio broadcasting (meaning radio without the traditional license, transmitter and tower) and the development of the online “media station” in the 21st century. To hear the entirety of this fascinating conversation between two seasoned, front-line media visionaries, please click here, or click on the “Up Close and Far Out” box in the right-hand column on every page of Talkers.com. Odds & Sods. Appearing in the KFAQ, Tulsa studios this morning is a crew from “Good Morning America” as morning host Pat Campbell interviews attorney Clark Brewster. Reserve Sheriff Deputy Robert Bates hired Brewster to represent him in the case of the fatal shooting of Eric Harris that took place during a drug sting. Bates has been cleared by the FBI of violating Harris’ civil rights but faces a second-degree manslaughter charge for accidently using his pistol instead of a taser on Harris. Pat Campbell tells TALKERS magazine, “Our station has been ground zero for many exclusives on this story, including the only sit-down interview with Sheriff Stanley Glanz. KFAQ news director Tami Marler has been all over this since day one, getting scoops and guests other outlets can’t secure.”…..FOX Sports Radio is presenting “FOX Sports Live 2015 NFL Draftcast” – a multi-platform NFL draft special featuring Jay Glazer, Joel Klatt, Peter Schrager, Mike Garafolo and Don Bell in Chicago. It will air on the network’s more than 400 affiliates nationwide beginning at 8:00 pm ET on Thursday, April 30…..The last Buckley Broadcasting property – KIDD-AM, Monterey, California – has been sold to Saul Levine’s Mt. Wilson Broadcasters for $50,000. Buckley took KIDD-AM dark a few months ago and recently tore down its aging tower structure. ISIS Violence, Iran Nuclear Program Controversy/U.S. Naval Presence in Yemen, 2016 Presidential Prospects, Police Shootings Controversies, and MLB Action Among Top News/Talk Stories Yesterday (4/20). The reports of ISIS executing Christians; the controversy about negotiations with Iran over its nuclear program and the United States’ naval presence in the waters off Yemen; the potential candidates for president in 2016; the cases of police shooting citizens in Baltimore, Tulsa and elsewhere; and the weekend’s Major League Baseball action were some of the most-talked-about stories on news/talk radio according to ongoing research from TALKERS magazine. Joe Pags Returns to KPRC, Houston. Beginning on Monday, April 28, WOAI, San Antonio-based Joe “Pags” Pagliarulo will also be heard on Clear Channel’s Houston news/talk KPRC as his afternoon show will be simulcast on both stations from 5:00 pm to 8:00 pm. In addition to his daily work on WOAI and KPRC, Joe Pags is also heard on Clear Channel’s syndicated “The Weekend” on Saturdays and on KOA, Denver from 2:00 pm to 5:00 pm on Saturdays. Syndication Reality: Measurable Audience Needed. 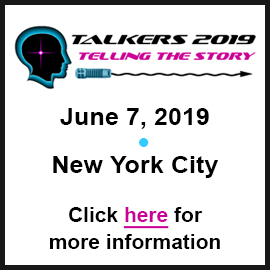 The latest piece from Global Media Services founder Tony Garcia published in TALKERS today (4/23) focuses on the reality that some broadcasters with syndication programming ideas don’t want to hear: It takes measureable audience to get the attention of agency people. Garcia writes that for any general interest radio program, the fact is that “media buyers look for large audience metrics.” Garcia says that means listeners, not necessarily affiliate stations. For more, read Garcia’s column here. Premiere Networks Distributing TheBlaze Memorial Day Special. The title of the show is, “Freedom: Love It or Lose It,” and it’s a production of Glenn Beck’s TheBlaze Radio Network. It’s an “exclusive three-hour Memorial Day radio special…featuring the hosts, writers and editors of TheBlaze and TheBlaze.com, including: Doc Thompson, Buck Sexton, Jay Severin and others. From personal stories to conversations about the meaning of the holiday, listeners will be treated to a special tribute to those who fought and gave their lives to defend our freedom, and the loved ones who support them.” Premiere says it’s available for news/talk stations to air between May 24 and 26. Emmis’ Jeff Smulyan Sits Down for NASDAQ Interview to Promote Radio Business. Some of the crew of Emmis Communications’ New York stations rang the closing bell at the NASDAQ last Friday and while visiting the exchange, CEO Jeff Smulyan sat down with journalist Kelsey Hubbard to appear on NASDAQ’s CEO Signature Series. Smulyan promoted his company’s efforts behind getting the FM chips in cell phones activated and in pushing the NextRadio platform. When asked about his company’s ability to prosper versus competitors including SiriusXM and Pandora, Smulyan stated that SiriusXM is a subscription service and implied it will always face challenges because of that. As for Pandora, he said his company has been streaming for 18 years and he’s yet to meet anyone who’s making money at it. “The cost structure is very different and I think that’s at the heart of it.” Watch the video here. Lionel to Appear at Big Apple’s Cutting Room with Live Talk and Music Show. Maverick radio and television talk personality Lionel will be “playing” at the Cutting Room, an innovative midtown New York City nightclub owned by actor Chris Noth, and known for its dedication to excellent live music and performances. Lionel, whose commentaries are seen by New Yorkers on WPIX-TV channel 11, tells TALKERS, “Don’t call it stand up!” Lionel’s in-person presentation consists of a unique mixture of spoken word and music – described as “extreme thought and critical thinking” — along with the live music of his bluegrass trio, Lock ‘n Load. The one-night performance takes place at the Cutting Room, 44 East 32nd Street in Manhattan on Saturday, May 10 at 8:00 pm. Tickets are $30 in advance, $35 at the door. 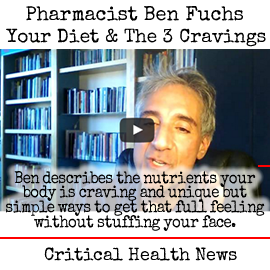 For more information call 212-691-1900 or click here. This is High School Radio Day. More specifically, it is the third annual such event. WBFH, Bloomfield Hills, Michigan (suburban Detroit) station manager Pete Bowers is credited with founding/scheduling the inaugural High School Radio Day in May 2012, as well as last April’s follow-up. 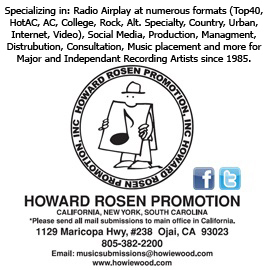 Estimating there are 200 high schools in the nation with an over-the-air non-commercial, educational radio station or an internet-only or online radio station, Bowers comments, “The number of terrestrial stations is dropping, but the number of online stations is increasing. Some of those are applying for LPFM construction permits. That is why we must unite on High School Radio Day and make the public aware of what we do, how we do it, and the service we provide our communities.” In 2012, 31 schools from 16 states registered for the event, compared to 52 schools from 32 states last year. 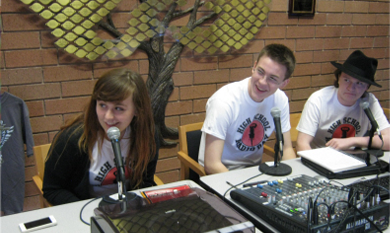 Today’s activities planned by participating stations are found at www.highschoolradioday.com. Also on the website are names of participating high schools with links to their websites and online streams of their programming. Celebrating CBS RADIO’s Move to DC. On Monday, TALKERS reported the plans CBS RADIO has to move its six-station cluster from its current offices in Lanham, Maryland to a newly re-developed part of Washington, DC – the Capitol Riverfront. 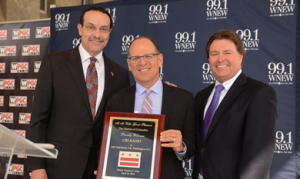 Pictured here at the Monday afternoon press conference at the site of the office building on Half Street SE are (from left to right): Mayor Vincent C. Gray, senior vice president/market manager of CBS RADIO Washington, DC, Steve Swenson, and CBS RADIO president and CEO Dan Mason. Russian Aggression in Ukraine/U.S. Troops Exercise in Eastern Europe, SCOTUS Affirmative Action Decision, U.S. al Qaeda Drone Strikes, 2016 Presidential Race/Mid-Term Elections, and South Korea Ferry Disaster Among Top News/Talk Stories Yesterday (4/22). Growing concerns over Russia’s aggression in Ukraine and the arrival of U.S. troops in Poland as exercises in Eastern Europe begin; the Supreme Court’s decision to again strike the Affirmative Action policy in Michigan; the United States’ use of drones to hit al Qaeda targets in Yemen kills 55 suspected terrorists; speculation about the candidates for president in 2016 and the looming mid-term elections this fall; the crew of the South Korean Ferry that capsized faces charges after allegedly failing in its duty to passengers were some of the most-talked-about stories on news/talk radio yesterday, according to ongoing research from TALKERS. Former Connecticut Governor John Rowland Resigns from WTIC, Hartford Show as New Corruption Probe Intensifies. The former Connecticut governor resigned from office in 2004 amidst corruption charges to which he eventually pleaded guilty and served 10 months in federal prison. He began a talk show host career on CBS RADIO’s WTIC, Hartford in 2010 – for the first two years with co-host Pastor Will Marotti of the New Life Church in Meriden before going solo – but now that gig is over as Rowland stepped down yesterday without addressing the new allegations. The Hartford Courant reports that testimony from local businessman Brian Foley and his wife, Lisa Wilson-Foley (a former congressional candidate) stated in federal court that they used a phony consulting contract with Rowland to pay him for political assistance to Wilson-Foley’s failed 2012 campaign. Rowland faces possible indictment by a grand jury. WTIC program director Jenneen Lee tells the paper Pastor Will Marotti will step into the afternoon drive slot beginning Monday. Read the entire Courant piece here. Big Changes at KARN-FM, Little Rock; PM Driver Dave Elswick Out along with AM Drive’s Bob Steel and ND. Longtime afternoon drive personality and program director Dave Elswick announces via Facebook that he’s out at Cumulus Media’s KARN-FM, Little Rock. Here’s his post: “I ask for your prayers tonight. After nearly 14 years on KARN I was fired by Cumulus Media. Bob Steel and news director Jack Heintz were also fired. I have no idea what will be on the station tomorrow. Know that I love every one of you who have supported me over these years. God Bless.” There were rumors of change at the news/talk outlet swirling but nothing concrete had been put out. As of now, the KARN-FM website lists the AM and PM drive dayparts generically. It’s possible Cumulus is clearing the afternoon deck to move Michael Savage into a live slot from the current late night delayed broadcast. Criticism of Mets Infielder’s Paternity Leave Reversed as WFAN’s Boomer Esiason Apologizes. The decision by New York Mets second baseman Daniel Murphy to miss two games to be with his wife in Florida after she delivered their son on Opening Day was a hot topic of conversation on New York sports talk radio and both WFAN afternoon host Mike Francesa and morning drive co-host Boomer Esiason opined that two games was too many to miss. But during the initial chatter, Esiason said that he’d have asked his wife to schedule a C-section in order to be with his teammates for the games. The MLB CBA allows for up to three days of paternity leave. Esiason apologized on WFAN’s morning show today (4/4), calling his comments “insensitive” and expressing contrition for having put the Murphy family’s personal lives “under a spotlight.” He also said his C-section comment was not intended to mean he was telling women what to do with their bodies. Nielsen Audio Quantifies the Obvious: Opening Day Is Big for Radio. What’s well known to radio practitioners is put into numbers by Nielsen Audio from this season’s Opening Day. While baseball – from a ratings standpoint – will be good to most MLB flagships this year, some of the Opening Day numbers are truly spectacular. In Cincinnati, flagship WLW pulled a 46.6 share with Men 25-54 on a 12+ cume of 270,700. Also, it’s interesting to note the difference in cume and share from the Cubs at Pirates broadcasts where the woebegone Cubs fans in Chicago didn’t appear to have the same passion (via radio, anyway) as the recharged Bucs backers in Pittsburgh. Check out the data here. Entercom Boston Boosts Mozdiez to Director of Integrated Media Strategies. It is a position the cluster specifically crafts for Carlson Mozdiez, who is elevated from director of digital operations. New responsibilities for the Syracuse University graduate include developing/executing customer-facing brand messaging, including live events, contesting and promotions, external advertising, websites, video, and social media. 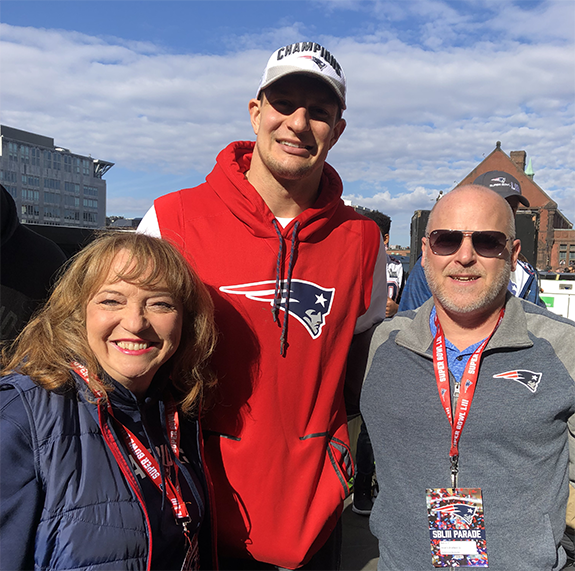 Entercom Boston vice president/market manager Phil Zachary comments, “Streamlining our ever-expanding array of digital and marketing channels, which connect the most valuable radio consumers in New England to our brands and our advertisers, makes logistical sense. Carlson is the ideal leader to spearhead these innovative efforts.” Mozdiez remarks that, “It is an exciting time as we continue to develop and optimize the ways people interact with our stations while creating new means for advertisers to access our audiences.” Entercom Boston consists of rock WAAF, sports WEEI-FM, sports WEEI-AM, news/talk WRKO, the Boston Red Sox Radio Network and their respective web properties. Mozdiez joined Entercom in 2002 as promotion coordinator for WEEI and WRKO. 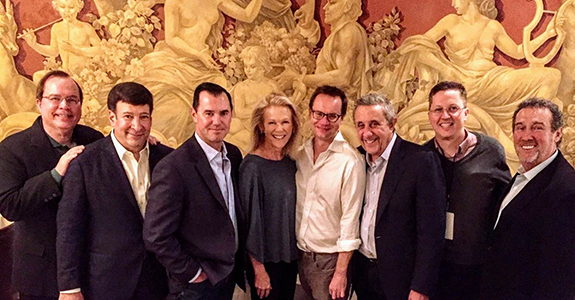 Dennis Miller Celebrates Radio Anniversary. Today marks the seventh anniversary of entertainer Dennis Miller’s nationally syndicated WestwoodOne radio program. The “Saturday Night Live” alum is commemorating the day with special guests including: Mark Steyn, nationally syndicated columnist and author of After America: Get Ready for Armageddon; Bob Saget, comedian and author of Dirty Daddy: The Chronicles of a Family Man Turned Filthy Comedian; Senator Rand Paul, Republican of Kentucky; David Spade, comedian; Frank Sinatra Jr.; and fellow SNL alum Dana Carvey. KDKA-AM’s Larry Richert to Be Roasted for Charity. Pittsburgh talk radio personality Larry Richert – co-host of the “KDKA Morning News on NewsRadio 1020 KDKA” will be the guest of honor at a Roast & Toast on Friday, April 25 to be roasted and toasted by friends and co-workers to benefit the Roxsan Betters Albanese Foundation. This foundation helps financially challenged families with children who are terminally ill or face a life threatening situation. Fellow KDKA-AM talk host Rob Pratte will serve as Master of Ceremonies. Odds & Sods. When Premiere Networks’ “America Now with Andy Dean” hits the air tonight, WTAG, Worcester morning drive talk show host Paul Westcott will be in the host chair. Westcott has become a regular fill-in for Dean when he’s away…..This weekend’s NCAA Final Four is being covered by SiriusXM. The satcaster says it’ll offer subscribers comprehensive coverage of this weekend’s action plus analysis on the College Sports Nation channel from hoops experts such as three-time ACC Coach of the Year Bobby Cremins, Hall of Fame Michigan State guard Mateen Cleaves, former Villanova and UMass coach Steve Lappas, former University of Vermont coach Tom Brennan, plus Tim Brando, Mark Packer, Chris Childers and Jason Horowitz…..Birach Broadcasting’s sports talker KXRQ, Des Moines announces it’s the newest affiliate for Kansas City Royals baseball play-by-play……Sunrise Broadcasting strikes an agreement with Sea-Comm Media to use the latter’s translator W240AS, Wilmington at 95.9 FM to augment the signal of its sports talk WMFD “ESPN Wilmington,” heard on 630 AM. ObamaCare Criticism Remains Atop Talkers TenTM. The major political issue of the past year – the passage of the Affordable Care Act – continues to be one of the top news/talk radio stories and was again the most-talked-about topic this week, according to ongoing research from TALKERS. Coming in at #2 this week was the deadly Fort Hood Shooting. At #3 was the looming mid-term elections tied with the potential candidates in the 2016 presidential election, and at #4 was this week’s Supreme Court campaign donation ruling. The Talkers TenTM is a weekly chart of the top stories and people discussed on news/talk radio during the week and is published every Friday at Talkers.com. View this week’s entire chart here. TALKERS to Postpone Publishing 2014 Heavy Hundred Until Tuesday, March 11. 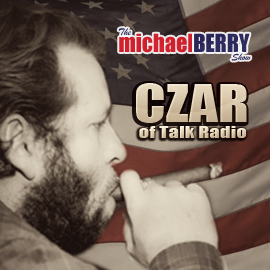 The 2014 installment of one of TALKERS magazine’s most popular and, perhaps, controversial annual features – “The 100 Most Important Radio Talk Show Hosts in America” – is being readied for publication this coming Tuesday, March 11, 2014. It was originally intended for publication today (3/3) but last-minute developments in the industry regarding the contracts and standing of several key hosts has required adding the extra week for consideration and tabulation. Also known as “The Heavy Hundred” the ranked listing of 100 hosts and talent teams from around the country is based on a number of both quantitative and qualitative criteria and is determined by collective analysis of the TALKERS editorial board. 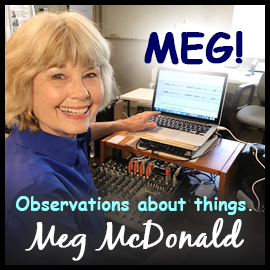 It includes local and national hosts from a variety of genres falling under the umbrella of “general” talk or “news/talk” radio covering politics, health, finance, relationships, consumer tech, popular culture and a variety of specialties. (TALKERS launched a special and separate Heavy Hundred of Sports Talk two years ago.) Hosts on the list are selected from those working at the time of its publication on platforms that include commercial and public AM/FM radio as well as satellite radio (internet-only talk hosts are ranked by TALKERS in an annual feature titled “The Frontier Fifty”). According to TALKERS VP/executive editor Kevin Casey, “It is no secret that economic restraints facing the industry these past few years have contributed to shrinking the number of individuals working on the air across the nation. Although the 2014 edition of the Heavy Hundred will, of course, include many familiar names, the need for new blood, fresh voices and potential up and comers has never been greater. Readers will find this year’s roster will feature a number of new names and first-timers, which is quite exciting!” Companies interested in sponsoring segments of this widely discussed and read (by hundreds of thousands of broadcasting industry members and consumers/listeners) feature should call 413-565-5413. Compass Media Networks Welcomes Susan O’Connell. Affiliate relations pro Susan O’Connell is joining Compass Media Networks as a consultant with the goal of managing and enhancing affiliate relations and strategy related to The Wall Street Journal Radio Network. O’Connell has served as senior director, affiliate sales for The Wall Street Journal Radio Network since 2006. Compass exclusively manages affiliate sales and advertising sales for WSJ Radio. Odds & Sods. Imaging and voice-over pro Pete Gustin leaves his gig with Entercom’s sports talk WEEI-FM and news/talk WRKO after 18 years with the stations. Gustin, who recently launched his own imaging and voice-over service, writes on his Facebook page, “I’ll be partnered with dozens of major national brands, programs, radio stations, TV networks, sports franchises and agencies like Solid Talent with Micaela Stepanovich, CESD Imaging — affiliates and Paul Wintner and Jason Helzner, who are both very much responsible for this new path I’m on.”…..WOLB, Baltimore morning show host Larry Young is honored as a recipient of the 2014 Verizon Community Innovator Award. The company says that Young was the only recipient of the award in the communications field. “We here at Radio One Inc. are very proud of Larry’s many accomplishments and this shows the great works he has done for the community and how he represents his community.”…..Center Post Holdings announces it is re-branding the Business TalkRadio Network to BizTalkRadio to reflect its new partnership with sister network BizTV. Center Post Holdings purchased BTRN last October . Rick & Bubba Read to 50,000 Kids in 13 States! Nationally syndicated morning show Rick & Bubba (Rick Burgess and Bill “Bubba” Bussey) recognized the National Education Association’s “Read Across America” day today by using technology to read Dr. Seuss’ Green Eggs & Ham to an estimated 50,000 students in 800 schools across 13 states. 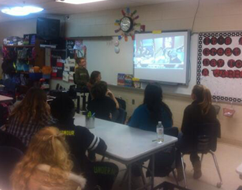 The SSI-syndicated show has made an annual tradition of creating the “world’s biggest classroom” on this day. In the photo here, Rick & Bubba are seen on a screen in one of the classrooms taking part in the event. Going for Woman of the Year. 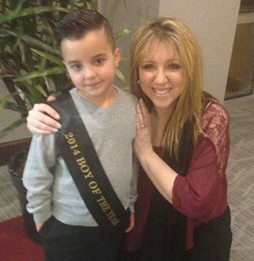 Nationally syndicated talk show host Dr. Daliah Wachs (right) is pictured here with two-time cancer survivor Dominic (left) as Wachs gears up to raise money for the Leukemia and Lymphoma Society of Las Vegas. Wachs was nominated for Woman of the Year so her goal is to raise $20,000 during the campaign that runs from March 21 through May 31. Wachs tells TALKERS the funds go to cancer research and financial assistance to families with children afflicted with blood cancer. Listeners can help by going to her website at www.drdaliah.com and hitting the “Fight Blood Cancer” link after March 21. ABC News Radio at the Oscars. Just a couple of hours before winning the Oscar for Best Actress in a Supporting Role for her work in “12 Years a Slave,” last night in Los Angeles, Lupita Nyong’o (right) stops on the red carpet to talk with ABC News Radio’s David Blaustein (left).